AP RC 21 Gnanadhara Summer Residential Remedial Teaching programme guidelines GNANADHARA-Summe Residential Remedial Teaching programme to D1 & D2 Graders of class V & IX in summer 2018 R.C.No.21/ B/SCERT/2018, Dated: 20.02.2018. 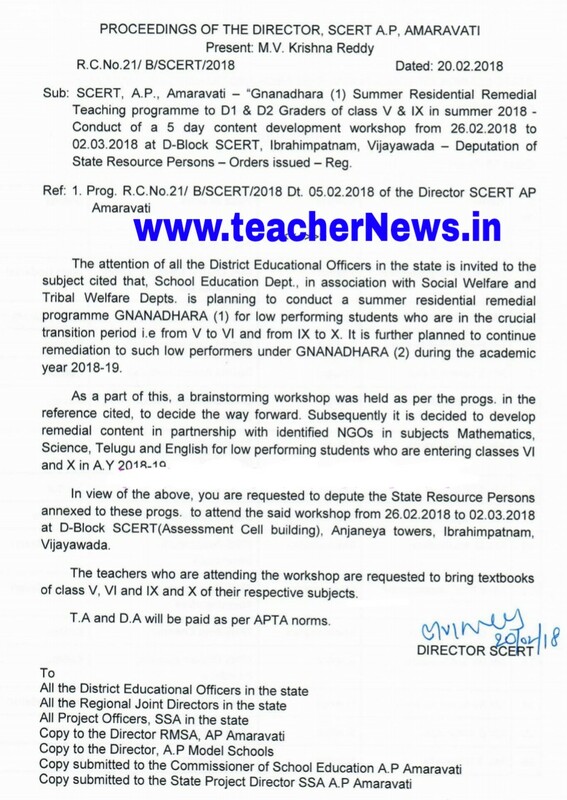 Sub: SCERT, AP., Amaravati - "Gnanadhara (1) Summer Residential Remedial Teaching programme to 01 & 02 Graders of class V & IX in summer 2018 - Conduct of a 5day content development workshop from 26.02.2018 to 02.03.2018 at D-Block SCERT, lbrahimpatnam, Vijayawada - Deputation of State Resource Persons - Orders issued - Reg. The attention of all the District Educational Officers in the state is invited to the subject cited that, School Education Dept., in association with Social Welfare and Tribal Welfare Depts. is planning to conduct a summer residential remedial programme GNANADHARA (1) for low performing students who are in the crucial transition period i.e from V to VI and from IX to X. It is further planned to continue remediation to such low performers under GNANADHARA (2) during the academic year 2018-19. In view of the above, you are requested to depute the State Resource Persons annexed to these progs. to attend the said workshop from 26.02.2018 to 02.03.2018 at D-Block SCERT(Assessment Cell building), Anjaneya towers, lbrahimpatnam, Vijayawada. AP Gnanadhara Summer Residential Remedial Teaching programme guidelines for D Grade Students in 5th, 9th Class .